Texas hold 'em (also known as hold'em or holdem) is another version of the standard card game of poker. A dealer shuffles the cards then deals 2 cards to each player and then five community cards are placed by the dealer—a series of three ("the flop") then two additional single cards ("the turn" and "the river"). Players have the option to check, bet or fold after each deal, i.e. 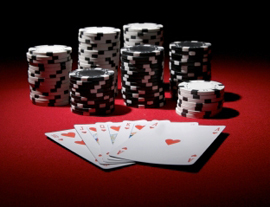 betting may occur prior to the flop, "on the flop," "on the turn," and "on the river." Texas hold 'em players compete either for an amount of money or chips contributed by the players themselves (this is called the pot). 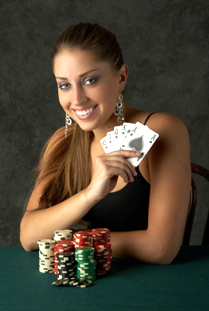 Because the cards are dealt randomly and outside the control of the players, each player attempts to control the amount of money in the pot based on the hand he or she is holding. When a Texas Hold'em Poker player wants to play poker, the general objective is not to win every individual hand, but rather to make mathematically and psychologically correct decisions regarding at what point and how much to bet, raise, call or fold. By skilfully making such decisions, successful Texas Hold'em Poker players maximize winnings in the long term.